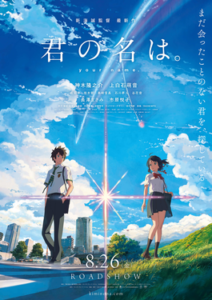 As of this writing Your Name is officially over 19.9b yen in Japan, over Howl’s Moving Castle, over all other Miyazaki and Studio Ghibli films except Spirited Away (ie, it’s No2 Japanese anime/film of all time) and into the all time top 5 (below Spirited Away, Titanic, Frozen and Harry Potter). Without a doubt, this is Shinkai’s best work to date. Hoshi no Koe: I won’t comment as it’s his debut work, his potential is already evident from this one. Place promised: Not much improved character drawing in addition to a dulldrum buildup complicated by a difficult world setting. 5cm per second: Fair to say his first true hit and gave him a cult following. The 3 interlinked short story worked well for the topic and the way events are revealed, however I think it can be said Shinkai recognizes his problem in bringing a coherent story to the screen in long form and used the short story collection as a sleight of hand to mask it. There is also a lot of plot points that are merely hinted at and required thoughts to understand. This in my view actually elevates the film and gave it incredible thoughtful depth, this cannot be said to be held by the general public. Children Chase Lost Voices: The less said the better… Shinkai is not Miyazaki and he shouldn’t try. Garden of Words: After the previous disaster this gave Shinkai to rediscover his roots and reestablish his footing. It’s acceptably short to allow a fairly simple plot to not be dragged out, however again there is no storytelling, no build up and no tension. The painterly character while good lacked dynamic to them (animation didn’t help either). It did have marvelous raindrops. Gorgeous, tender, sad, but not exciting (exciting doesn’t mean good, but exciting is needed for a movie to be a hit I think). In short, Shinkai’s weakness are in telling a long story in an interesting manner, problem with drawing and giving life to characters, and poor tension throughout. His strengths always remained and there was the potential that once he finds a way to address his shortcomings he can create something remarkable. His beautiful background work, his ability to set moods, his incredible knack for putting composing cuts and scenes that ties each scene together. As long as those weaknesses remained his films remained well received but unpopular. His last film did just 150m after all, barely a blip and cannot compared to even other anime films. Actually before Your Name, one must first look at Crossroad, Shinkai’s 120 second ad for Z-Kai (remote education cram-school) which came out in 2014. It’s about a highschool girl from a seaside rural town studying to go to uni in Tokyo, and a highschool boy living in Tokyo also studying via Z-Kai as he need to work part-time in addition to school. The ad follows their journey as they study, sit exams, and finally chance into each other while looking for their names in the uni entrance results announcement boards. Crossroad can be seen as the root and practice run, possibly giving Shinkai the inspiration and confidence and team to tackle his greatest challenge. In my view Tanaka is one of the very key. His character design fit surprisingly well with Shinkai’s visual styles and solves one of Shinkai’s biggest problems in creating characters. Tanaka’s style is also very energetic, his characters are full of spirit and conveys emotions well. Then Shinkai also brought on board the animation director Andou from Spirited Away. Together the two covers the character and animation side, leaving Shinkai to turn attention to his other weakness, plot and tension. It’s hard to pinpoint how Shinkai managed to improve his storytelling skills to this degree. Sure, the plot is hardly innovative (especially if you’re familiar with galgames), but Shinkai really made the three arcs flow without seemingly forced, everything is properly foreshadowed yet not obvious to be predictable. I think what really made the plot work is Shinkai’s decision to go with a happy end. Shinkai explained that he felt after the 2011 earthquake Japan was already full of sorrow, and he felt Your Name should be something that brings joy and hope to people. This changes everything as it meant the overall tone can be much lighter, comedy be added, and a buildup to a climax without people throwing out the popcorn. (I’m of the opinion a built up climax that ends badly comes across as unfair/cheap shock, a bad end necessitates a gradual spiral similar to 5cm/s). Regardless of any material effect on plots, the happy end certainly ensured it was more ‘hit’ friendly. Not many people want to watch a sad movie many times (maybe at home when they’re in the mood). In essence, Shinkai managed to produce a work that is incredibly complete and of high quality. Decent story, good characters and comedy moments, in additional to his trade mark visuals and evocative tone. It’s good, but what made it explode is probably a combination of fortune and timing. Originally Toho the publisher’s plan was a production budget of 0.8b + ~0.8b in marketing, hoping to score 1.5~2b, maybe double that if they got lucky. It’s aimed to do decent for an anime film, not spectacular nor an anchor feature. (In comparison rival director Hosoda’s last few ones ranged from 4 to 5.8b. The popular brand animes One Piece 6.8b, Detective Conan 6.3b, so the original estimate of upward of 4b is already optimistic). Toho chose to release the film at the last week of August, in other word last week of summer break. Traditionally anchor films are released early in Summer Break to take full advantage of the bored school kids. Since Toho didn’t expect Your Name to be big they wanted to leave the summer slot to Shin-Godzilla, but since Your Name is aimed at teens they went half-way and released it in the closing week. And why not, anime fans are known to be dedicated so releasing in the last week give a chance to give a boost to opening numbers, after that most people who wanted to see it would probably have seen it. This supposed disadvantage may have ended up helping in an ironic twist. So the stage is set. Shinkai has his most refined work to date on hand, there were expectations that it will do good (for an anime) but quickly fade away once the initial rush. The first weekend did better than expected, doing 930m. Hurray, this looks to be a hit so it’ll earn a lot for an anime, but it’s still an anime along with the same expectations of poor legs. Toho thus adjusts their estimates to 6b. Which at the time was ridiculed by some. Expectations remained that the hype will quickly fade. Instead, the hype built. Social media exploded and it’s hypothesized that teens who returned to school spreaded words amongst their friends about the great anime they saw the weekend before and encouraged others to go watch it too. Skeptics who had doubted Your Name was no longer laughing as Japan descends into a Your Name social phenomenon. Could Your Name do 10b, the mythical wall above which is reserved for Studio Ghibli only. No other Japanese anime films had ever crossed that barrier. Many directors have certainly tried, for anyone who crossed that boundary was assured a place next to the great Miyazaki. Already, the title of Shinkai Makoto, Post-Miyazaki was being whispered. Toho hurried to take direction of the unexpected runaway hit, just as cinemas all over Japan scrambled to meet the tide of cinema goers. Every seat was selling out. Usually cinemas would post notice at the door writing out which timeslots for which films that day was full, for Your Name it was easy to write. A simple poster and the words “Sold out for the day”. Plus the next day too. The film industry had been praising Shin-Godzilla (which did about 7b by this time) as the new model of revamping Japanese films, now gazed jaw-dropped while this impossible event unfolded. Start of school was meant to be a lull period, instead the cinemas was packed even on weekdays. One cinema staff exclaimed “Busy from early to late. Look at the lines at the counter and ticket machines, it’s more despairing than seeing Godzilla make landfall”. On Week 3 Monday and Tuesday, Your Name together did 600m. Numbers other films will gladly take for an opening weekend Your Name was pulling over two weekdays 3 weeks in. For the first month Your Name was pulling about 2~3b every week (by comparison Fantastic Beast did 0.8 on opening weekend and 1.7 over 5 days). Within 28 days Your Name crossed the magical 10b line. A legend is born. It was no longer a question of whether Your Name can be a mega hit. It was a question of how far. It’s true Shinkai’s has a cult following and is well known amongst the anime industry, he remains a no name on the wider scale and common awareness. From an unknown director, in an original film, released during school periods. It was unprecedented, no one had any idea nor had any references to draw on. Shinkai remarked that seeing Your Name approach 10b was both exciting and terrifying as he did not think his skills had improved to such degree. The film’s own creator struggled to come up with an explanation. The milestones were inevitably drawn out against the works of Miyazaki. The Wind Rises at 12.02, Ponyo at 15.5 seemed possible. But Mononoke at 19.3 and Howl’s Moving Castle at 19.6, were deemed to be unlikely, surely. Your Name smashed 15b by week 8 toward middle of October. The phenomenon continued to spread. Hida Furukawa, a mountain town which appears in the film was drawing in a crowd of pilgrims eager to visit the film’s setting locations. In the town library where the protagonist and friends conducted their researches saw 100 visitors on weekdays and up to 500 on weekends. The town hurried to put out tourism tie-up campaigns to take advantage of their new found popularity. It’s estimated that the pilgrims will bring in over 15b in tourism money, for a town of less than 25k residents. The initial craze had faded somewhat, by which it was only doing about 1b a week instead of over 2b. 20b, a number unfathomable by everyone, is now all but inevitable. Apart from the previously mentioned unintended word of mouth spread by the start of school, what made Your Name the runaway hit is it struck a chord outside its intended audiences. Shinkai stated he aimed for the under 30s, and fair enough the initial audience breakdown was over 7:3 for young people. But toward November that ratio had fallen to about 5.1:4.9. The film was drawing in older people too, even people in their 50s or 60s. There’s a few things I think which contributed to this, where Shinkai’s weakness became his strengths. Shinkai’s works are incredibly direct. His works are not reflective but introspective. Other films (cough Miyazaki) may tell a message via story and actions, upon looking at the characters or looking at the outcomes and consequences, the audience is brought to think about the world or themselves. Shinkai does the opposite, his works are decidedly not about actions or story, but emotions. His imagery, music, editing, all works to draw out emotions from deep within, emotions one may not even realize one had. It’s incredibly spontaneous and organic. Then upon experiencing these emotions, one looks within oneself and discovers something about themselves. One does not think about Shinkai’s film, one simply feels it. One does not need to think about where the story is headed as you are already in it, feeling it that very moment. This meant once you’re sitting in that cinema chair, you’re going to feel it, whether you really understood the film or can follow it or not. For example, to this day I still have next to no idea about what that tower in Place Promised is or why the girl fell unconscious or why they need to fly to it, but goodness do I always feel a swell of emotions watching it. I will go as far as to say Shinkai’s works is art in its purest form, where meaning is directly conveyed without needing to be explained the finer symbolisms. The film echoed the fear in people after the 2011 earthquake, as Shinkai said it’s possible for people to wake up to find their homes and lives gone. The falling comet posed a threat which was very close to home and authentic, and the happy end afterward incredibly relieving. Shinkai’s style is very different from other mainstream animes. The closest is probably KyoAni. Definitely something the general public have not seen in anime. I call it Enhanced Reality. If Studio Ghibli is a fantasy which you can escape into, then Shinkai is all about creating something that you can believe is around you right now, real and beautifully surreal, no need to fantasize as you’re right in it. This style is almost unique amongst animes. Those who know Shinkai have already seen it, we are impressed by his improvements. Imagine someone seeing an anime this beautiful for the first time. It also makes an incredibly easy sell, when all it takes is retweeting a single image of the film to amaze the other person. It’s hard to take a single frame of other animes and still make a story out from it. For Shinkai’s you can easily do. Shinkai is a maverick. He’s not just talented, his background is beyond incredible. Having worked at game company initially he decided to give up and created Hoshi no Koe entirely by himself at the age of 29. Instead of joining animation studios he continued essentially on his own. He is both artistic and well read, yet have worked on several galgames. He is both an outsider (to animation) and yet very much an insider (as otaku). An unknown who loved anime so much he struggled for 14 years, making a pittance each time, yet overnight became the most famous director in Japan behind only Miyazaki. It’s a good underdog story, about someone striving against the odds and achieving his dreams. Makes for great entertainment to tell at tables. Juxtaposing Tokyo and rural Japan, it connects both Japan’s past, present and future. Unlike Miyazaki who loathes modern world, Shinkai embraces it. Tokyo has never looked so magical, the cityscape never so bright, so full of wonders. It connects directly to the audience, makes them rediscover the city they live in. At the same time the beautiful rural landscapes reminds those who came from outside Tokyo of their hometowns. The importance of traditional Shinto rituals and crafts in kumihimo (braided cords), is placed right along the glitter of Tokyo’s finest cakes and desserts. It celebrates all of Japan, in all its forms. For the longest time Japanese animation has suffered against western animations. A common perception is that only Miyazaki can put out something of the same level, yet here is a new talent whose film is exceeding all hopes over the Disney animations, not only that but also breaking box office overseas. The media cannot help but cheer it on. Without a doubt Your Name has rewritten the landscape for Japanese films but especially the anime industry. I sometimes think of anime as the following sub-groups. Intellectual – The Studio Ghibli, where works are seen as art and elevated above others. For all ages – The Conan, the Precure, the Doraemon, the Dragon Ball. Anime that runs in primetime and is aimed at all ages, is known and accepted by all. Jumpsters – People who is mostly into the Shonen manga/animes. Naruto, One Piece, Bleach. This is mostly what people refer to when they say someone is into anime, as it’s the one where people are aware of but not necessarily into. Traditionalists – The ones into Gundam and EVA and quite likely laments the state of the rest of anime. The late nighters otaku – People who watch the late night animes and is into collecting all kind of figurines and other (cough) merchandise. The big spenders and passionate. Sometimes things here makes the break into the Shonen (like SAO). The artoku 雅宅 – Art + otaku. Which I will say Shinkai falls into. Or the light novelists (before the medium got swamped by harem and pantsu hell). While anime and manga are often seen as an easy or shallow medium for people looking for quick entertainment. The introverted nature of the culture means there’s a misunderstood and understated portion of people who are actually quite cultured, and simply loves anime alongside other interests for various reasons. As anime industry struggles to regain mainstream audiences companies have targeted the Shonen and Otaku crowd as they have the highest spend, however even that is being overdrawn and the expensive merchandises are no longer selling as well. So either they double down (shrinking), or they shun the otakus and aim somewhere between Shonen and All Ages in the hope of gaining more mainstream audiences (but mainstream audiences doesn’t pay as much as otaku, it’s still a rich pie to give up). Shinkai instead reached from the other direction with his very artsy and melancholy works, creating something which spans a much broader spectrum. Somewhere between Otaku, Artoku, Intellectual. I think Your Name will make anime studios much more open to experimentation, strive to put out more refined works and not aim at the otaku or for-all-ages. There has always been a debate about whether anime should be hand drawn or digitally drawn. Shinkai embraces computer (he did work at a game company…). Actually I question if he can even draw with a pen, he is terrible at drawing as seen from the characters in Hoshi no Koe. Your Name’s triumph pretty much guarantees the scales now tip even more toward digital if not already before. This is more a personal hope than probably reality. For the longest time if you love anime you’re directly labelled as weird and twisted. Can’t entirely blame that perception given the amount of lewd content flying around in late night anime. Given Shinkai’s background, perhaps people will begin to look at anime with a little more understanding, that anime isn’t all shallow silly harems.